Name: The surname was recorded in Kent where they were seated from ancient times and is of Anglo-Saxon origin. The name occurs most frequently in Kentucky, Virginia, West Virginia, and South Carolina at about 1:1,000, and in the rest of the nation at about 1:5,000. 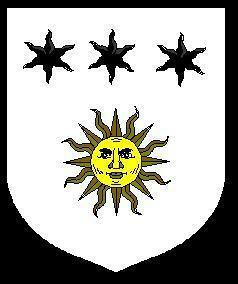 Shield: Silver with three black stars at the top and a gold sun. SomeDescendants of John Hammond, Sr.